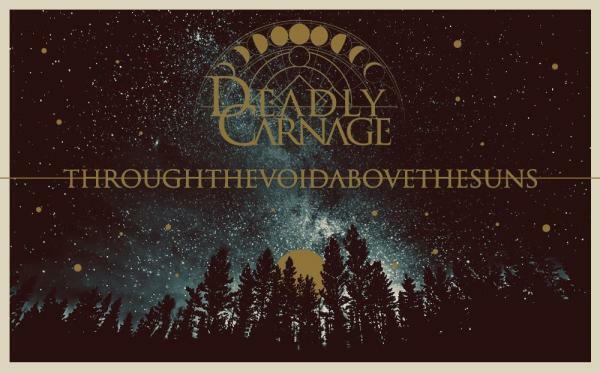 DEADLY CARNAGE’s “Through the Void, Above the Suns” is a phenomenal journey, an unmatched vision of the Cosmos with all its tangible and intangible components: stars, dark matter, black holes. Forces that regulate it up through Light and Time. Each of those often intangible elements has been characterized and almost humanized, to transcend their original dimensions in order to explain themselves to us in an intelligible, universal language of knowledge and enlightenment. It’s a travel that proceeds from the infinitely small world of raw matter to infinite cosmic distances, where Time and Space finally coincide. After everything has been born and has made its course in a myriad of random possibilities, it comes to entropy, to the absolute frost, the loss of every light, the complete end. And, right after, the Universe starts to breath once again, and the eternal cycle restarts. While in the past DEADLY CARNAGE have explored existentialism, with this new chapter they move towards an universal vision, halfway between science, philosophy, occultism and spirituality. “Through the Void, Above the Suns” is the fourth album of the band, but it is the first concept album in 12 years of activity. The processing of this album lasted about 4 years. All previous works have been recorded with another singer, this is the first album with Alexios on vocals (Alexios was already the band’s guitarist since 2011). 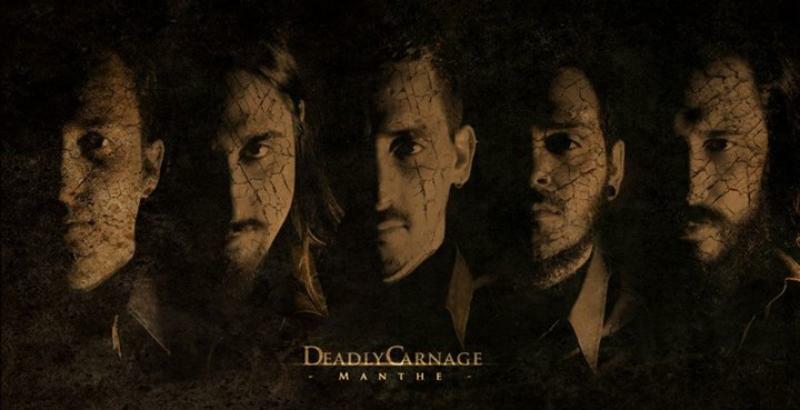 DEADLY CARNAGE was born in 2005 from an idea of Adres (bass) and Marco (drums), after the first few periods of militancy in the Black/Thrash Metal scene, the intentions of the band begin to change; the sounds become more atmospheric and introspective. In 2007 Deadly Carnage began a slow shift away from the Black Metal scene in favor of Doom, Post-Rock and Post-Metal influences. This evolutionary period is crowned with the release of “Manthe” in 2014, but the change of Deadly Carnage has not set a limit, the intention of the band is to continue to experiment, evolve and explore new territories without posing musical limits, without barriers. “Through the Void, Above the Suns” represents another chapter in this evolving. “There is a sacred geometry in the whispers of the strings, creating music in the space between spheres, take a journey through the Void, above the Suns. Start to inhale quantic hummings, vibrating, chaotic energy fills the void following the first information given: Birth, Create. Where no eye can create Matter with his sight, the real fabric of the universe create the basic pillars of the existence: the Hyle, in bright giant furnaces. And Cosmos can be called like so, following a second law: Procreate. So light trasmits the data of life. Light, Lumis, Light. Cosmos is living, Cosmos is breathing. And we are through Streams of Shine. Eye that creates Matter at sight, Matter that bends time at will, then Cosmos duplicate himself to be aware of his own potential. Segments, Ifenes, portions of frozen spacetime. A view of a giant infinite fractalized universal Tree, where every branches are a pulse of a Divide in the storming dusts of time. From infinite possibilities, universe create a multiverse, channeling in this line of spacetime. This is the choosen path. Cosmos is living, Cosmos is breathing. And all goes to repeat where dilute gases uniform to the void, time’s exhale: End, Entropy. Cosmos is living, then he follows the third and last order given: Destroy, dragging its charm of absolute emptiness. But we are a single breathe of his quantic lung, feeling again a geometry, whispers inside spheres. We are travelling inside his body to keep it alive. Universe needs a conscious sentient being from the essence of stars. Cosmos is living. Cosmos is breathing.